The details of the Amish Bent Feather Bow Dining Chair contribute to an incredible colonial style dining room chair. From the deep scoop in the seat to the paddle shaped spindles to the beautifully turned legs, this colonial American furniture serves up comfort and style for your dining room furniture collection. Handcrafted in an Amish wood shop in Indiana, the Bent Feather Bow Dining Chair features classic Windsor elements within its comfortable design. 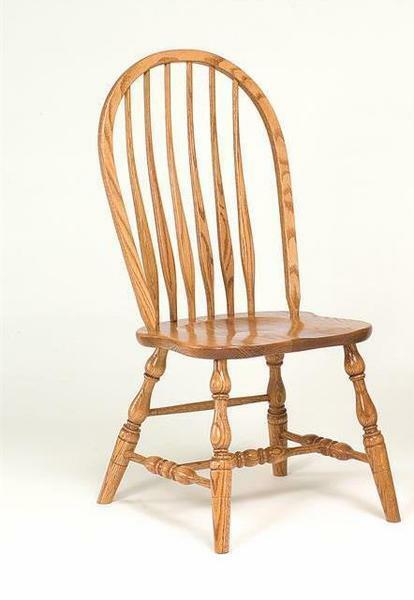 This multi-spindled chair is conservative and elegant and contributes to both a country style furniture collection or colonial style furniture collection with ease. Be sure to view the Amish Bent Feather Bow Back Windsor Bench and the Amish Bent Feather Windsor Storage Bench for more colonial style seating options. The Bent Feather Bow Dining Chair is shown here in oak wood with golden honey stain. Oak furniture is light colored and warm, creating an inviting atmosphere in any room. This traditional style dining chair works well with a traditional pedestal table or leg table. Available in side and arm chairs to complete your dining room furniture collection. Select the wood and stain you're looking for from five wood options and a variety of stains. We are happy to send stain samples for you to consider. DutchCrafters works closely with business owners to offer solid wood furniture that's a custom fit. Consider these American made dining chairs for your restaurant or country club. Visit our Contract Sales Page for more information.